ORGANISERS OF TODAY’S 1913 commemorations in Dublin are promising a ‘family oriented event’ — thousands are expected to attend in Dublin city centre as President Michael D Higgins leads the official State event, marking 100 years since the brutal industrial dispute. Proceedings begin at 12.30pm at the statue of trade union leader Jim Larkin on O’Connell Street. A minute’s silence will be observed, after a wreath laying by the President. Lord Mayor Oisín Quinn is then set to make an address, after which there will be a series of readings from Strumpet City – the epic historical novel that depicted the events of the Lockout. Music will be provided by the Army Number 1 band. Today marks exactly 100 years since Bloody Sunday; three people died and more than 500 were injured at a mass meeting in what was one of the key events of the Lockout, which saw Dublin workers fight a sustained battle for rights and pay. 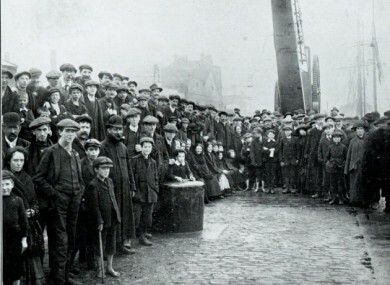 Tens of thousands of workers – and an estimated 300 employers – were involved in the pitch battle which lasted from August 1913 and January 1914, and which was the most severe industrial dispute in Irish history. President Higgins has frequently spoken about the significance of the Lockout, describing it as an “important chapter of Irish labour history”. The commemoration will be followed by a reenactment of the events of Bloody Sunday, which saw police baton-charging a large crowd which had gathered to hear Larkin speak from the balcony of the Imperial Hotel. The Irish Congress of Trade Unions – which is organising the commemorations – is stressing that the city centre, including all main car parks, will remain open for business today. Buses will be running through O’Connell Street until 11am, and will resume around 3pm – with services taking diversions during the event. The Luas Red Line will run as normal. ICTU Assistant General Secretary Sally Anne Kinahan said “we’re encouraging as many people as possible to come into Dublin city and make Saturday a special day out by attending our events and availing of the shopping and hospitality facilities in the city centre before and after the event”. This evening, the President will also attend a performance of ‘The Risen People‘, a drama set during the Lockout by Strumpet City author James Plunkett at the Séan O’Casey Theatre in East Wall . - Additional reporting, Christine Bohan. Email “Thousands expected to attend 1913 commemorations”. Feedback on “Thousands expected to attend 1913 commemorations”.